Ever wonder what a pot strain "looks like" as a piece of art? LEAPH, a Cannabis Company in Washington, licensed "Courage". Their art department, Leaph Creative, started a packaging project to pair artists & their art with strains of cannabis. My art was selected for the strain "Cherry Pie". Their project went on to win an award for Best Packaging in an industry wide competition. Hay House UK contacted me to license this image for a book coming out mid 2017 -- "Jaguar in the Body, Butterfly in the Heart: The 21st Century Initiation of an Everyday Shaman" by Ya'Acov Darling Khan. The book is available for pre-order or Amazon, and will be released June 6th, 2017. The way the title of the story suits the nature of the image, it's hard to believe this image was not made specifically for this book. Fly Life Disc Golf had paid for some custom art for their disc golf company to use on discs, however the current art was not up to tech specifications to be compatible with the printer. So I've taken much of their pre-existing art and redesigned it to be properly formatted and use-able. A pretty basic website transfer - the original website was designed around 2003, and the client wanted to keep the design, but switch to a new platform. We used a content management system so business owner could have the power to add new content, which they do very often. The site has overall been designed for mobile, which is probably the best way to view it to get the owner's overall intentions. Website for an upcoming community-based periodical called Cycling Seasons. It is in a work-in-progress phase with the graphics, but it is live! Mother-daughter duo has a business selling their hand-made organic candles. I teach the daughter digital illustration, so they asked me to help bring their concept for their labels to life. It is based on a scene from "Amadeus" - We are still not finished with the typography and will finish the project at the end of the summer when her daughter returns from summer break. 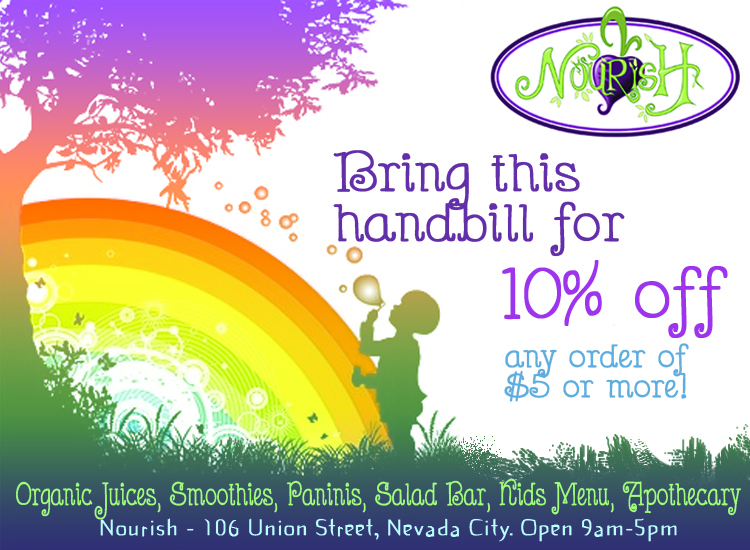 Nourish is an Organic Cafe in Nevada City. When they opened, they did very little advertising, so I have made several handbills and flyers for various projects relating to basic marketing for them. They like my art, so I sometimes get to use my own art work. The cafe also features a large scale mural that I painted a few years back with some friends of mine. Ann worked for the International Council of 13 Indigenous Grandmothers. She received a grant to record a special prayer song she had created from quotes of wisdom she gathered from the Grandmothers over many years as program director. She hired me to create art for the album cover, the album layout, and the the booklet of wisdom teachings. I created 13 vector "totems" to represent each Grandmother, and designed the cover from photos provided by her daughter, Marisol Villanueva. I did considerable photo editing and manipulation for the inside pages of the book and layout. This is still one of my favorite projects to date.